Everyone wants a piece of the pay TV market. All those opportunities for growth, market disruption and the proverbial pot of gold continue to attract all sorts of players (no pun) so it’s going to become a pretty crowded market as more guys jump in. It shouldn’t be a surprise then that even new Zimbabwean startups are also eyeing the same market. 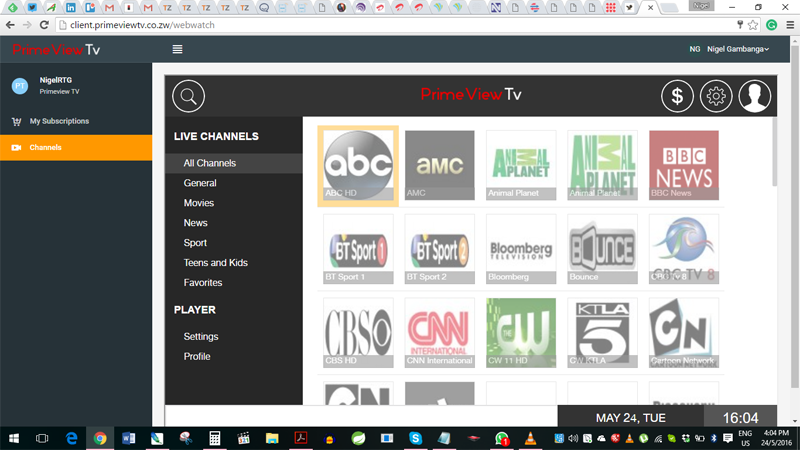 One example is PrimeviewTV. This is an internet based service that provides its subscribers a live TV solution which is different from the video on demand (VOD) alternatives like Showmax and Netflix that have made a big splash in the past year. According to the guys at PrimeviewTV, though the service is provisionally available – users interested in trying it out can sign up on the site and access the content- the platform is still undergoing some final changes as it’s prepared for an official launch later this year. This trial run has gathered feedback from a limited number of signups (less than 200) and their recommendations have been contributing to some of the changes being made to the platform. Content on PrimeviewTV includes pay TV staples like series and movies with some sports and news thrown in. All this is classified by the different channels that include some familiar names like Fox, HBO, Bloomberg, Cartoon Network, AMC, ABC, SkySports, TLC, and MTV. This content is available in three packages going for $14.99 (Basic), $19.99 (Prime) and a $12.00 package that’s exclusively for sports which include some European football. One thing that’s hard to miss is how the content is similar to another Zimbabwean pay TV service that we wrote about a while ago called Uhuru TV which also mashed up sports content from SkySports together with the same familiar channels like HBO. Though the name of the content provider has been withheld and just been referred to as a Russian outfit, it looks like it’s a third party distributor of material which is easily identifiable but ordinarily difficult for smaller pay TV startups to secure because of costs. This gives these smaller types of outfits a shot at the TV market. What is not so easy to determine though is if these boutique operations like PrimeviewTV are then ready to compete with the larger providers that have deep pockets. In VOD and pay TV services this is a significant factor that outpaces any “startup passion” because it informs aspects like the continuous acquisition of content, the improvement of the user experience and presentation (user interface) of their platform (I wasn’t impressed by these two aspects for Primeview TV) and product/strategy improvements like placing content on local servers for faster access and the optimisation of data use. PrimeviewTV has to figure all of these issues out while going up against well-heeled existing competition like Netflix and Showmax as well as yet to launch live TV providers like Kwese TV. Still, all the challenges that come with stiff competition and the huge barriers to entry won’t keep services like PrimeviewTV and all the other ambitious startups out of pay TV. IPTV delivers TV programmes via the Internet, as opposed to satellites or terrestrial radio signals. Content still follows a schedule as would normal TV programming. For example, the news 8 is shown at 8 for all subscribers. VOD delivers the content you want to watch, when you want it. You can watch a movie, pause it, stop it or restart it, at your own discretion. Are these guys actually paying redistribution fees or they are just repackaging free online streams which could be taken down anytime because they are illegal? I highly doubt the former. *ALSO: Techzim, what’s this terrible commenting system? You can’t get Disqus or something? Their target market is the same as targeted by Netflix, Kwese, etc. That cake is too small. The rest of us barely afford to chat on Whatsapp for a month, why the hack would I watch tv online in an environment like Zimbabwe. The cost of accessing the internet is one of the major reasons why Multichoice/Dstv is not bothered by all these start-ups that soon shut-up. They could even offer the service for free, but as long as internet options remain as they are, it all fun and games for startups (..or shut-ups) and brisk business for Dstv. The only other people who can afford real internet, are busy with netflix at the moment.